TiePie Handyscope HS5 arbitrary function generator offers the lowest THD in its class. TiePie's exclusive Constant Data Size (CDS) technology enables generating true form (point-by-point) arbitrary waveforms with exceptionally low jitter and high fidelity. CDS has many advantages over its predecessor, the well known DDS system. CDS technology is now applied to the Handyscope HS5 Arbitrary Waveform Generator, making it a function generator with great flexibility and unparalleled performance, at the price of a common DDS function generator. This article shows the exceptional qualities of CDS compared to DDS. TiePie's CDS technology internally uses a low-jitter temperature compensated clock, capable of synthesizing any frequency, to linearly drive data from the waveform memory to a digital-to-analog converter (DAC) creating the analog signal. Because no memory values are skipped or repeated and each value is output for the same amount of time, the result is an optimal true form point-by-point arbitrary waveform. The CDS technology used in the Handyscope HS5 Arbitrary waveform generator is superior to traditional Direct Digital Synthesis (DDS) which has been applied in the recent decades. DDS has many drawbacks, such as high jitter when generating low frequency signals and a high Total Harmonic Distortion (THD). CDS eliminates these drawbacks and gives every engineer access to an Arbitrary waveform generator with characteristics previously unaffordable. To illustrate the difference between DDS and CDS, figure 2 shows the same arbitrary waveform generated by a DDS function generator (Handyscope HS3) and by a Handyscope HS5 CDS function generator. The arbitrary signal consists of a period of a sine wave with 5 spikes superimposed. 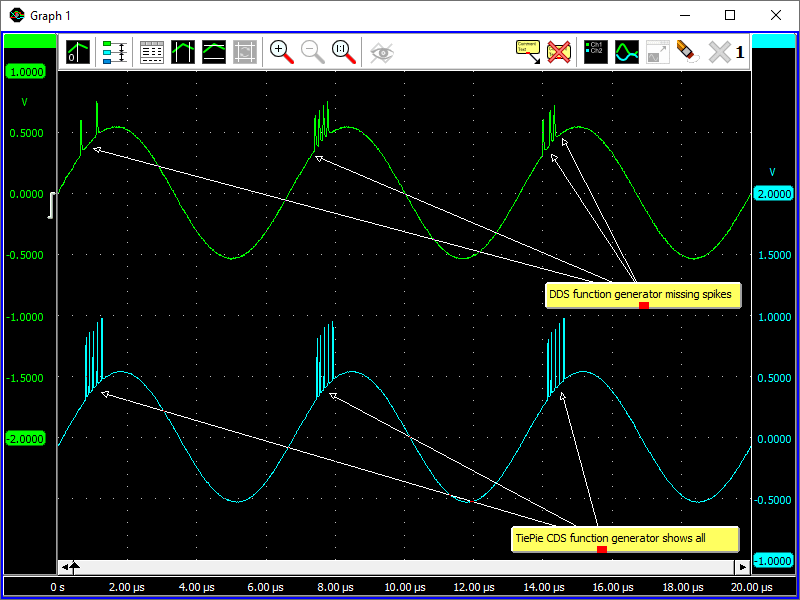 While the DDS function generator (green line) misses spikes at random, the revolutionary CDS function generator (blue line) consistently generates all spikes, since every point in waveform memory is used by the CDS technology. This shows that for correctly generating the true form of a signal, a CDS function generator is a must for every engineer. Another difference that can be observed, is the different spike amplitude. This is caused by the fact that the Handyscope HS5 CDS function generator has a much higher bandwidth than the DDS function generator. 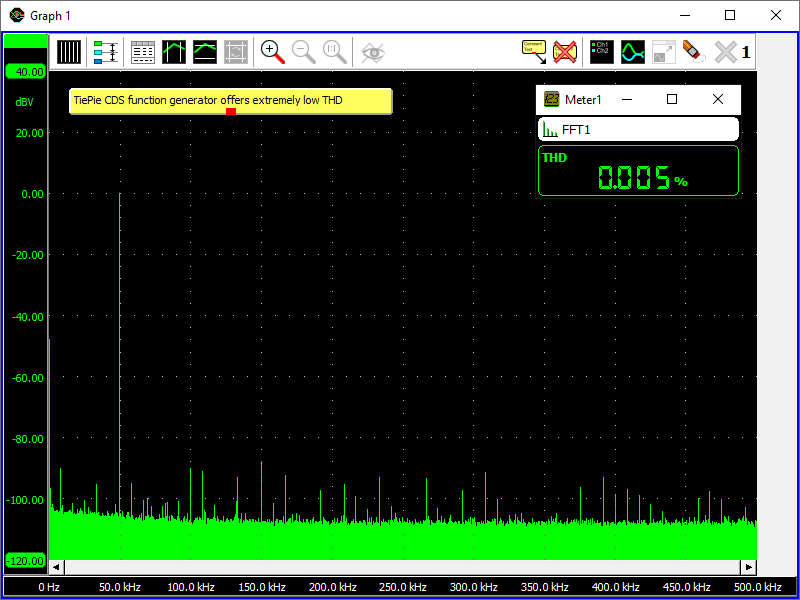 The Handyscope HS5 CDS Arbitrary waveform generator outperforms any DDS function generator in many ways. Its jitter specification is 25 times better than a DDS function generator and generated CDS arbitrary waveforms have a higher fidelity, showing the true form of a signal. Refer to table 1 for a comparison of several properties of DDS and CDS function generators. Table 1: Advantages of a Handyscope HS5 Arbitrary waveform generator equipped with CDS technology. segmentation and sequencing are possible. Since the Handyscope HS5 equipped with CDS technology uses every point in waveform memory and no points are skipped or repeated, arbitrary waveforms are reproduced much more accurately. This results in an extremely low Total Harmonic Distortion (THD) as illustrated in figure 3, which shows a spectrum of a generated 50 kHz sine wave. Figure 3: TiePie Handyscope HS5 offers the lowest THD in its class. A 50 kHz 0 dB sine shows a -90 dB second harmonic and third harmonic of -88 dB. The TiePie CDS technology is superior to the old DDS which has some serious drawbacks with respect to jitter and distortion. Starting with the TiePie Handyscope HS5 combining an oscilloscope and Arbitrary waveform generator, TiePie engineering is now using CDS technology to maintain all performance advantages of DDS while eliminating its disadvantages. Each point in waveform memory is used, and used only once, to produce a true form waveform, which means waveforms are reproduced with higher fidelity. Jitter and distortion are significantly reduced. Additional capabilities such as segmentation and sequencing are now possible. Being such an innovative and advanced technology, CDS gives the function/arbitrary waveform generator industry a new impulse for now and many years to come.